Super Mario Maker in its New Super Mario Bros. U form. Super Mario Maker (スーパーマリオメーカー, Super Mario Maker) is a downloadable stage that appears in both versions of Super Smash Bros. 4. It was officially revealed on September 14th, 2015, and was released on September 30th, 2015. The stage also appears in Super Smash Bros. Ultimate. The stage is based on the game of the same name. 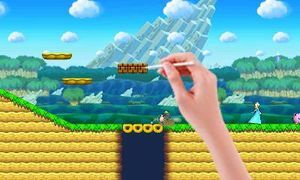 At the start of a match, a randomly chosen cursor from Super Mario Maker customizes the stage's layout. Fighters start on pink temporary platforms that vanish when jumped off of, rolled on, or walked off of. During the match, the cursor will repair any blocks that break on the stage. This stage is customized by the cursor in four different game styles: Super Mario Bros., Super Mario Bros. 3, Super Mario World, or New Super Mario Bros. U. Occasionally, the styles will switch at random mid-match. In Super Smash Bros. for 3DS, the standard version of the stage alternates between two of the four themes, but in Super Smash Bros. for Wii U, it scrolls through all four. The Ω form for both versions of the game cycles through all four themes as well. In Super Smash Bros. for Wii U, various Mario objects and enemies sometimes fly by in the background, including Bullet Bills; a Hammer Bro, a Koopa Troopa, a Lakitu flying by in clouds, and a Goomba riding a Koopa Clown Car. In Super Smash Bros. 4, the Ω form of the stage features a single platform whose bottom extends downward slightly using inverse slopes. Thus the layout of the stage will always be the same, but the four themes will still change randomly, making this one of two Ω form stages that can appear differently. In Super Smash Bros. Ultimate, the Ω form and Battlefield form function identically to how the Ω form does in SSB4; however, the stages are slightly resized and reshaped to match Final Destination and Battlefield, respectively. The characters are still flat, which also flattens the hitboxes and alters gameplay significantly as a result. Ω form (Super Mario Bros. theme) in Super Smash Bros. for Nintendo 3DS. Ω form (Super Mario Bros. theme) in Super Smash Bros. for Wii U.
Ω form (New Super Mario Bros. U theme) in Super Smash Bros. Ultimate. Battlefield form (New Super Mario Bros. U theme) in Super Smash Bros. Ultimate. The layout of Super Mario Maker. The foundation for the original title was conceived as a spiritual successor to Mario Paint, as Nintendo was interested in creating a new installment for the Wii U utilizing the GamePad’s potential as a drawing tool. Meanwhile, the in-house development tools that would usually be used to create 2D Mario levels were pitched to Nintendo as a standalone project. Nintendo veteran Takashi Tezuka decided to combine the two concepts into one, and the result was Super Mario Maker, officially revealed at E3 2014 and releasing in September 2015 in commemoration of the series’s 30th anniversary. In the original Wii U game, players can create their own 2D Mario levels to play and share online using the four themes found on this stage. While editing a level by using the Wii U GamePad's touchscreen, a cursor appears on the TV screen as either a hand holding a stylus, a cat's arm, Mario's arm, or the hand cursor from Mario Paint. If a player tests their level with Mario placed above a bottomless pit, he will spawn on a small pink platform. Each theme includes Mario’s moveset from that respective title, such as the spin jump, kicking objects vertically, and the wall jump. The four game styles come with a multitude of themes such as Ground, Underwater, Underground, Airship, and Ghost House. assets from across the four styles can be placed including the game-exclusive power-ups such as the Super Leaf and Propeller Mushroom. Most of the playable characters of Super Smash Bros. 4 (the exceptions being Mii Fighters, Roy, Ryu, Corrin, Bayonetta and Cloud) are available in Super Mario Maker as costumes for Costume Mario, unlocked via amiibo or by playing through the 100 Mario Challenge, which tasks the player to beat a certain number of levels starting out with 100 lives. These costumes are accessed via the Mystery Mushroom, only available in the original Super Mario Bros. game style. Subsequent patch updates would add new assets and features such as Event courses with more Mystery Mushroom costumes, checkpoint flags, keys, and a new difficulty option for the 100 Mario Challenge, Super Expert mode. A 3DS adapted port of the game, Super Mario Maker for Nintendo 3DS was announced a year after Super Mario Maker's initial release and released in December 2016. It contains most of the features of the original game and separates certain assets such as arrow signs and checkpoint flags, while omitting certain features such as the Mystery Mushroom costumes and amiibo support and limiting course sharing to local wireless instead of over Nintendo Network. An expanded sequel for the Nintendo Switch, aptly titled Super Mario Maker 2, will be released in June 2019. This sequel adds many new features that have not been seen in either the Wii U or Nintendo 3DS entries such as slopes, water tiles, snake blocks, custom scrolling, enemies such as the Angry Sun from Super Mario Bros. 3, mini-bosses such as Boom Boom, desert, jungle and snow themes, and a new game style in the form of Super Mario 3D World along with its exclusive Cat Suit power-up, clear pipes, and enemies such as Piranha Creepers. Super Mario Maker's unpredictable stage layout has lead it to be universally banned from tournaments, as it can range from being fairly neutral to being cramped, featuring caves of life, camping spots, or stage hazards such as lava, disrupting the fight. Also, the hand that repairs the blocks can come in at the wrong time and stop recoveries. The Super Mario Bros. style. Lava in the Super Mario Bros. style, along with a tilted platform. The Super Mario Bros. 3 style. Lava in the Super Mario Bros. 3 style. Ice blocks in the Super Mario Bros. 3 style. The Super Mario World style. The New Super Mario Bros. U style. The stage transitioning from Super Mario Bros. 3 style to New Super Mario Bros. U style. Bowser using his up smash on Yoshi on the stage. Pac-Man using Power Pellet on Wii Fit Trainer on the stage. Mario with a Super Leaf floating over Piranha Plant's blue, gray, pink, and green costumes on the stage. In Japan, Super Mario Maker is the most recent game represented in Super Smash Bros. 4, released about three weeks before the stage released, but in Europe and North America, it is beaten by Fire Emblem Fates. Certain structures in this stage such as slopes, tilted platforms, and pools of lava cannot be replicated in the Super Mario Maker game. 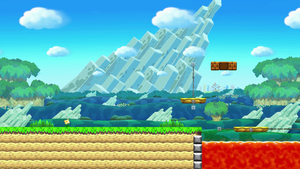 Lava only appears at the bottom of stages using the Castle theme, and slopes cannot be placed at all. Slopes and tilted platforms eventually found their way into Super Mario Maker 2. 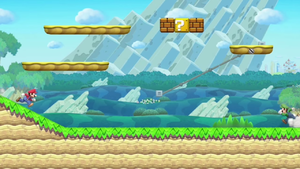 Super Mario Maker is the first Super Smash Bros. stage with any part of its design based on Super Mario Bros. 3. Super Mario Maker is the only stage in Super Smash Bros. for Nintendo 3DS based on a game which debuted on Wii U.
Super Mario Maker is one of three stages in SSB4 to share music with other stages, the others being Pirate Ship and Big Battlefield. Castle Siege and Coliseum also share two tracks if Corrin is downloaded. Prior to Super Smash Bros. Ultimate, Super Mario Maker had the largest music selection of any Super Smash Bros. stage, at 27 tracks. In Super Smash Bros. for Nintendo 3DS, it is one of two stages to have more than two music tracks, having five possible tracks. Dream Land has six possible musical selections. Super Mario Maker and Duck Hunt are the only stages where Star KOs only occur in Super Smash Bros. for 3DS. However, it does not feature Screen KOs, similar to another stage in the Wii U version. Super Mario Maker is the only paid downloadable stage that is neither a past stage nor bundled with a fighter. Despite being from the Mario universe, it is also the only DLC stage in the 3DS version and the only paid DLC stage in the Wii U version to not appear in All-Star Mode. In Super Smash Bros. Ultimate, Super Mario Maker is not used for any character's Classic Mode route in any form. This is the only stage in the series to have an official reveal trailer. This is the only stage in the 3DS with a slippery surface (although it doesn't always have one), including Smash Run. This page was last edited on April 16, 2019, at 02:45.